This is just another complacent surrender of the BLM to pressure from livestock ranchers, a convenient tactic to proceed with wild horse eradication. The lawsuit, filed in U.S. District Court of Wyoming by the public interest law firm, Meyer Glitzenstein and Crystal, alleges that the BLM violated the National Environmental Protection Act (NEPA), the Wild Free Roaming Horses and Burros Act (Wild Horse Act), and the Administrative Procedure Act, by authorizing the permanent removal of hundreds of wild horses from public and private lands within these three HMAs, known as the Wyoming Checkerboard. BLM has authorized this large-scale roundup of wild horses from public land in Wyoming without conducting any environmental analysis, without engaging the public during the decision-making process, and without making certain statutorily required determinations under the Wild Horse Act. BLM is justifying its decision by claiming the agency is required under a consent decree with the Rock Springs Grazing Association to conduct this roundup. This consent decree resulted from a lawsuit that the Interior Departmentinvited and then settled by capitulating to the rancher’s demands – the elimination of wild horses from the Wyoming checkerboard. 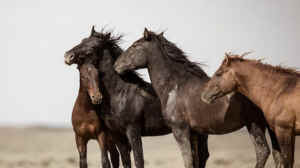 Nothing in that agreement, however, authorizes BLM to violate the multiple federal statutes and regulations that govern the permanent removal of federally protected wild horses from public land. AWHPC and The Cloud Foundation were intervenors in the RSGA litigation that resulted in the Consent Decree, and have been fighting BLM’s implementation of the decree since that time. The groups are asking the court to stop the roundup, which is scheduled to begin on August 20. The American Wild Horse Preservation Campaign (AWHPC), is a coalition of more than 50 horse advocacy, public interest, and conservation organizations dedicated to preserving the American wild horse in viable, free-roaming herds for generations to come, as part of our national heritage. AWHPC is a campaign founded and sponsored by Return to Freedom.